Wood burning stoves have been unfairly targeted by blogs, the press … just about everyone lately and are being painted in a very negative light. The reality, which in my view is very different to that portrayed in the press of late. So i will attempt to address the matter somewhat here in this post. Firstly, wood is one of the only truly renewable fuels but yet is often compared to diesel due to some of the particles that are emitted when burned. Diesel is a fossil fuel derived from crude oil and although some particles are emitted during burning wood (in a bad way & in old appliances) I’m pretty sure that diesel does not produce a major percentage of the worlds oxygen like trees do. With the massive deforestation that has takes place in recent history, ethical log suppliers are now rapidly planting trees which will help safeguard our future generations. Those same planted trees will store the carbon released from today’s log burning making the cycle neutral. Statistics can be a funny thing and are often taken on an annual basis. As we know, the wood burning season in the U.K. is relatively short beginning late September through to the end of March/April. During the rest of the year any measured pollution does not come from wood stoves. Ironically it is the summer months when the dangerous carbon dust particles are often at their highest levels. As far as i am aware, there are no statistics specific to wood-stoves published in the U.K. with regards to air quality or pollution. Instead statistics are based on all domestic burning of wood and its’ derivatives and includes open fires, camp fires, pizza ovens, BBQ s and bonfires. The last two in the list are some of the very worst pollutants and yet somehow only wood burning stoves are being attacked. I understand that there is a genuine problem with the use of some wood burning stoves. There are four main issues that chimney sweeps must advise on; in regards to wood burning in order for clean combustion. 1. Moisture content and quality of wood logs. During the combustion process it is necessary for there to be high enough temperatures within the firebox in order to burn the majority of the carbon particles. When excess water is present, the energy which would normally ignite these particles is instead utilised to evaporate the water contained in the log. This causes much of the fuel contained within the wood to not burn and is instead emitted as smoke. **I personally always suggest you only burn sustainably sourced (preferably hardwood) logs with less than 20% moisture content. Using wood-sure logs will help as the checks have already been done but you can always invest in a moisture meter and check for yourself. 2. The way the end user burns their stove: specifically the dangers of slumbering, over-fueling or under-fueling. As is often with many ‘old school’ things, some strange ‘old wives’ tales have developed about how stoves should be used. It has unfortunately become a ‘normal’ practice for many to fill the stove with wood and then reduce the air supply in order to make it last through the night. The process is referred to as slumbering and it is very bad indeed with regards to air quality and pollution. Not to mention the safety and functioning of your stove +/ liner. To use layman’s terms; if you remember the Bunsen burners in school science labs. When the air hole on the side is open the flame is sharp, blue and clean. But limit the oxygen by closing that hole and the result is a flame that becomes lazy, yellow and soots up whatever it touches. This yellow, colder flame in also inherently more dangerous because the levels of carbon monoxide are very much higher in a reduced oxygen environment (combustion is incomplete). Limiting the oxygen results in a much lower combustion temperature meaning many volatile components do not burn when slumbering, therefore it is far more polluting. Like all hydro carbon based fuels wood needs oxygen in abundance for all of the gasses emitted within the fire box to combust completely and cleanly. Limiting the air does not limit the gas released by the logs it only limits how much of the gas will burn. 3. The third problem relates to the age and efficiency of the stove. It is a fact that older stoves are very much more polluting than newer, more modern appliances. ****Consumers should be advised that new appliances will save on fuel, give more heat and allow much better quality air that we breathe. 4. Finally, servicing and maintenance. It is understood that regular sweeping of chimneys, cleaning flue-ways and servicing appliances are all essential for continued efficient combustion. Chimney sweeps should ideally ensure that stove servicing and education is a part of their repertoire in order to bring this essential service to their customers. *****Indeed, my own advice is always to burn clean dry logs (<20%). Do NOT slumber and use the correct amount of fuel in each fill. For what it’s worth i also try to suggest clients update outdated appliances where necessary and should get our sweep service up-to two times per year. It is the general opinion of the profession that further debates or articles should be fairly measured against all sources of pollution and not unfairly target wood burners alone. The minutiae of the fixes for wood burning stoves are simple and the industry has made great progress in these areas already. Surely, the issue of particulate emissions rests firmly in the hands of other industries; which now need to be ethical as we have always been, engage in debate and effect change. For example; one wonders what is being done to educate the consumer with regards to, BBQ s Chimeneas, patio heaters and pizza ovens? Thousands of these are sold each year in the UK and yet such heavy polluters never make fair target for the press? As previously mentioned they are often used in the summer when pollution is at its highest. Also consideration too, should be given to bonfires and the burning of urban dung fires which produce extreme amounts of pollution. In conclusion, the discussion on clean wood burning needs to be addressed holistically and not simplistically target any one tiny segment of the overall market. Using your newly acquired wood/multifuel stove , will give months of long , easy & warm cosy days , where you can lounge around just enjoying yourself. However, as with all things that are subject to temperature variations, maintenance checks are essential giving you peace of mind and satisfaction everything is running to optimum conditions. Often times these, “checks” may seem as if they might drag you out of your comfort zone but the good news is, in using a stove thermometer, it’s as simple as making regular readings once you’ve attached it to the stove top or flue pipe arising from the stove. They come in a few varieties and can be wire , hose clipped or magnetically attached. They are used primarily to avoid over firing, the resulting extreme temperatures created and bad fuel efficiency. Operated by having a eye gauge in both °Celsius and Fahrenheit. Keeping your stove burning in the Correct range of 115°C – 245°C or (240°F – 475°F) will ensure the safest operation , whilst simultaneously giving maximum fuel economy. Allowing your stove to reach burning temperatures below 115°C or (240°F) will lead to incomplete combustion creating carbon monoxide, tar, soot and creosote. Creosote , itself is a condensation residue of coal and/or wood particles, hydrocarbons, gases and other airborne debris. It is formed as gases cool , for example when air in a chimney is not hot enough to push the particles out. Its appearance is of a thick hard black shiny goo which reduces the bore of the flue by sticking to the inner bore. When you allow your stove apparatus to run above burning temperatures of 245°C or (475°F) you risk damage; warping your grate and also to your flue/liner/cowl too. A significant increase of the risk of chimney fires is created, especially if there has been creosote build up. Read our other articles under ‘stoves’ or burning ‘wood’ to get all the knowledge you need to use your appliances to maximum efficiency and safety. Also Please remember to get your solid fuel heating appliances swept at least once a year by your chimney sweep. 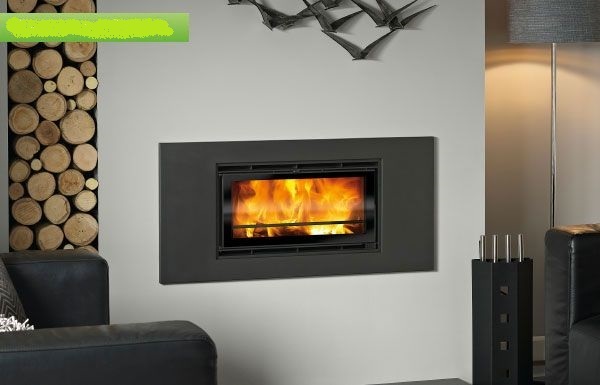 So twice already this year i have come across (perhaps they are becoming popular now, i cannot say) the type of stoves that are inset into the wall, flush with the edges and a few feet above ground level such as can be seen in figure 1 below. This of course makes it very neat and tidy to the eye but what might be pleasing aesthetically to the owners eye; might very well end up a frustrating task for myself or create the need for a service/installation engineer call out (much more money) for cleaning instead. Now i cannot generalise of course as every case is different and I’ve only come up against two like this so far (and the second was designed and fitted well), so i am just sharing my experiences so far this year. In the first of these cases, the actual inside of the stove did not have any kind of direct access to the vertical flue pipe, seemingly assuming the gases etc would flow up over a tiny lip edge at the front. It was essentially, just a jigsaw puzzle of very fragile vermiculite tiles , some of which (due to their fragility) were already broken. Yes i know perhaps some might say; ok turn around and walk away and i was initially tempted to do so but in retrospect, i am glad i didn’t do that. During the course of that particular job i also proceeded to find a large lump of concrete blocking the flue pipe (i bet the draw improved immensely, lol) and that the metal edge plate that held the top or “ceiling” tiles in place was warped due to being very thin and poor quality. I am not about to mention the company involved other than to say, they of course immediately denied any blame whatsoever (when questioned by the customer about servicing and cleaning) and tried to suggest i had somehow been at fault. This same company is not cheap and they used to have a reliable reputation as at least one of the best companies of its kind in Ayrshire but you know everything changes and good things sometimes go bad and even occasionally the reverse may be true too. Like any other kind of stoves , all heating appliances are subject to their own material quality and the standard of the installation. As we are so often reminded today . we live in an information age, the age of choice. So, as with anything it pays to do your homework before making any decisions and get & stay informed as possible. One phrase i find myself using repeatedly in this trade is, “prevention is better than cure”. The customer concerned was shrewd enough to know who was telling the truth of course and i was happy to assist as best i could. NB/ In case this is the only post you have read here, you might want to find out more about stove installations on our HETAS post category posts.